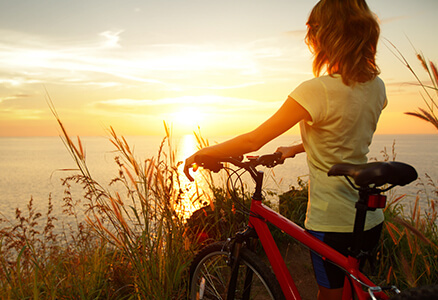 Biking is a good way to improve fitness. Be it a ride in the park or part of an intense training, this sport helps you burn around 250 calories to 450 calories per hour. Since it is physically demanding, nutrition and hydration is prioritised a little more than training. It is very essential to consume healthy meals and drinks with a high intake of carbohydrates before biking. A recreational rider needs a carbohydrate intake of 5-8 g per kilogram bodyweight whereas cyclists, who are subjected to intense training, would require 8-11 g per kilogram bodyweight. The carbohydrates are stored in the muscles and liver as glycogen - the fuel for bikers. Glycogen instantly converts to glucose that helps to sustain energy and endurance while biking. Porridges packed with oats and bananas are rich sources of carbohydrates. Also, addition of fruits like blueberries, mango and cherries in smoothies and pancakes could amplify your intake of carbohydrates. Grab some muffins made of smashed apple, bananas and blueberries or a simple whole-wheat bread sandwich or pasta before you are out for your morning ride. Besides carbohydrates, bikers should also have enough proteins and polyunsaturated fats as they aid in muscular and cellular growth and repair. They also keep bikers satiated while riding so they are never deprived of energy. A simple sandwich with peanut or almond butter smeared on whole-wheat bread is a good option to power up before the ride. Even milk and all milk products like cheese and fat-free yogurt are great reservoirs of proteins. Non vegetarians can have scrambled eggs or a piece of white meat chicken for breakfast or for dinner the previous night. You can crush some almonds and hazelnuts and have it with oatmeal porridges as well. Energy bars made of good oats and cereals, mixed with dry fruits like raisins and apricots strike the perfect balance of carbohydrates and proteins. Not just before the ride but you can have them while riding as well. Energy bars are easy to have and helps in sustenance while riding. Cyclists need to have a balanced and healthy diet that consist adequate amounts of iron, calcium and omega-3 fatty acids. Lean meat and beans are good suppliers of iron. Calcium rich foods like milk, yogurts and eggs would assist in muscle growth. Overworked muscles are effectively repaired with the consumption of salmon and walnuts that are rich in omega-3 fatty acids. Nutrition and hydration are two sides of the same coin. Body muscles would assure proper functioning when they are constantly hydrated with plenty of fluids. Though water is the most obvious choice, energy drinks and other fluids are also equally important. Energy drinks contain soluble glucose like fructose and dextrose. They can be digested easily and transferred quickly from the digestive tract to the blood stream. Tea and diluted juices are also good options. While aggressively stuffing yourself with carbohydrates and proteins, make sure that the food is keeping you comfortable. Riders won’t receive quality exercise if they have to experience gastrointestinal issues like diarrhoea or bowel upsets. So try to avoid excess fibre, excess fatty and spicy foods, caffeine intakes and alcohol. So fuel up your body with good nutrition, get into the grips of this sport and enjoy your biking endeavours.